The Happy Twin is our modern take on the classic winged swallow twin fin. 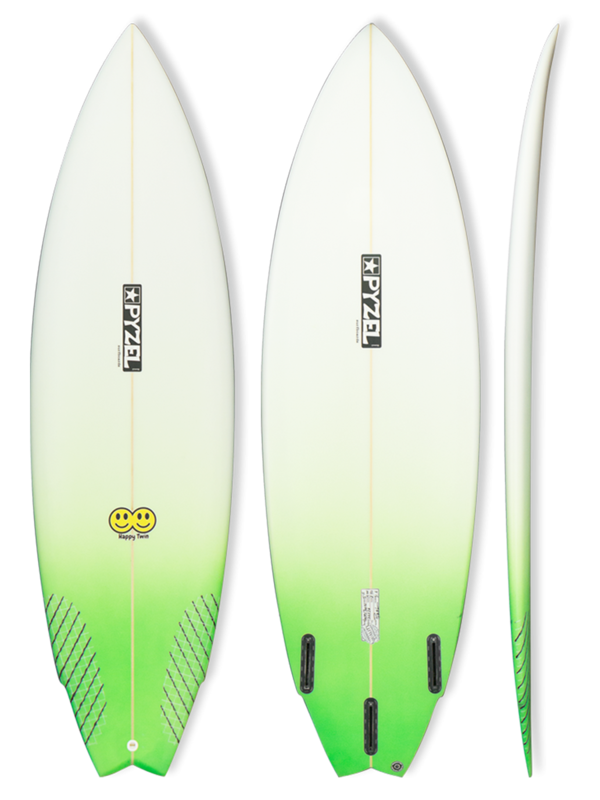 Built for down the line speed and lightning fast turns, easy paddling and maximum fun. It features a full, yet racy outline, with wide point forward (but not at all fish-y) , and a single wing right behind the front fins that creates a pivot point for snappy turns and bite. The rocker is flatter for easy speed and lots of glide in slower surf, and the bottom design is a signature double concave within a single, blending into a pronounced Vee off the tail to ensure smooth, seamless rail to rail transitions. The deck has a special, inset double concave shaped into the chest/front foot area that gives it that already "broken in" comfortable feeling on your very first surf. it also features an old school "beak" nose. A rear fin box (or plug) allows for the use of a stabilizer to add some drive without taking away from the overall feeling of the twins. The Happy Twin is a great addition to your quiver not only smaller surf, but also for a unique fast and free experience in more favorable conditions at nearly all wave types worldwide. We recommend ordering your height or slightly under, around 1" wider and a touch thicker than your shortboard for a slightly increased overall volume and glide.